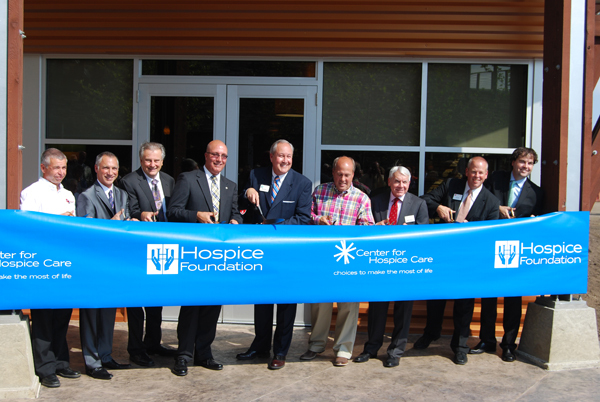 On August 20, 2013, Center for Hospice Care and Hospice Foundation officially opened their new Mishawaka Campus. Nestled between the beautiful northern shore of the St. Joseph River and the soon to be renovated Central Park, the organizations’ new home perfectly compliments the surrounding area. The simple yet elegant exterior of stone, corrugated metal and wood make the building timeless. The ribbon cutting ceremony included remarks from Center for Hospice Care President/CEO Mark Murray, Hospice Foundation Vice President/COO Mike Wargo, National Hospice and Palliative Care Organization President/CEO Don Schumacher, Mishawaka Mayor Dave Wood, and former Mishawaka Mayor and current St. Joseph County Chamber of Commerce President Jeff Rea. Following the remarks, the speakers were joined by Center for Hospice Care Board of Directors Chairman Corey Cressy, Hospice Foundation Board of Directors Chairman Terry Rodino, Jeff Helman and DJ Construction Company, Inc CEO Bob Schrock as they cut the ceremonial ribbon. When the ceremony concluded guests entered the building to enjoy refreshments and take tours of the buildings. The event was attended by an estimated 300 people, including government officials; contractors that worked on the building; Center for Hospice Care employees and families, Board Members and supporters; as well as area business owners and neighbors to the new facility. 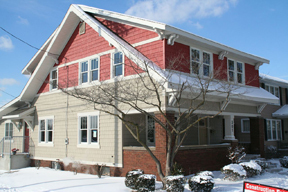 The western building, located immediately adjacent to Central Park, is the home to Center for Hospice Care’s Life Transition Center (LTC), its art counseling program and bereavement counseling staff. The current LTC had been located in leased office space in Mishawaka’s Cambridge Center Office Park since 2005. The first floor of the new building also includes a large conference area that can seat up to 165 people or be divided into three smaller, private rooms accommodating any one of a different uses, ranging from staff or board meetings to group counseling sessions and community education seminars. 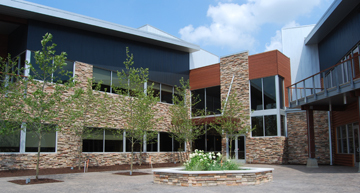 The Hospice Foundation offices are located on the second floor of the building. An open staircase to the second floor walkway connects this building, the main entry area and the eastern building which houses the administrative, information technology, human resources, accounting, billing, marketing and community relations departments. The first floor of that structure also includes an employee fitness center and an open plan café-style gathering space, great for informal staff interactions, lunch breaks and special events. In addition to the new construction, renovations are taking place in two additional campus structures. A residential home has been remodeled for use as a guest house and the former Edgewater Florist building has been transformed into a new Palliative Care Center. The structures, located immediately across the street from one another at the corner of Cedar and Madison Streets, were acquired as part of what has become a nearly five-acre campus development.